This is not a new or inventive idea by any means, but I have realized most Alphabet Activities are geared toward pre-school aged children...............12-18 month old children can benefit, as well. In my opinion, the key is low expectation of holding the child's attention for a prolonged period with this activity. Instead, look at the letter box as an opportunity to allow your child to explore objects starting with the same letter. 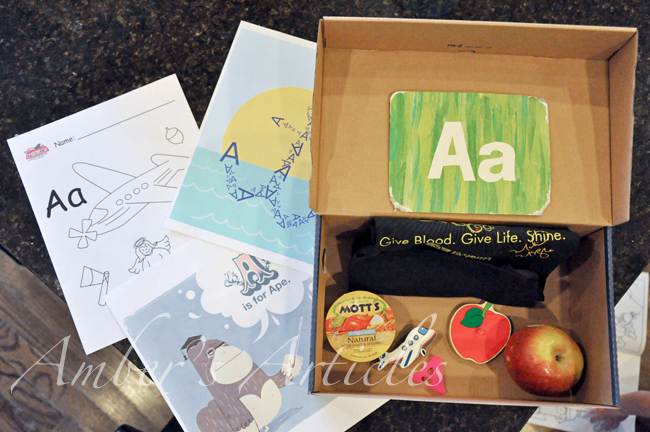 You can also point out objects throughout the day that begin with the letter that was the focus of your box. Fill a container (I typically use a shoe box) with objects beginning with the letter of your choice. Alphabet Curriculum has a fantastic list of objects corresponding with every letter. 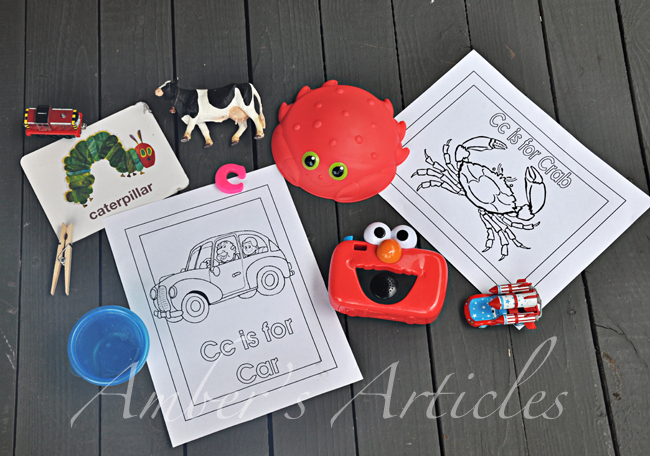 They also have printables, crafts, and other lessons that are letter specific. I have been including the plastic magnetic letter and the corresponding Eric Carle Flash Card , but this is not a must. We sit in the floor and I say the letter while showing him the flash card or the magnetic letter. Then, I give him the box to explore. I have also been singing the phonics of the individual letters (using the song Leap Frog uses). For example, "A says Ah. A says Ah. Every letter makes a sound, A says Ah." Then, after he is finished playing we listen to a nursery rhyme that goes along with the letter. Mama Lisa's World of Children is an excellent resource for finding nursery rhyme's that go along with the alphabet. I also look on YouTube. 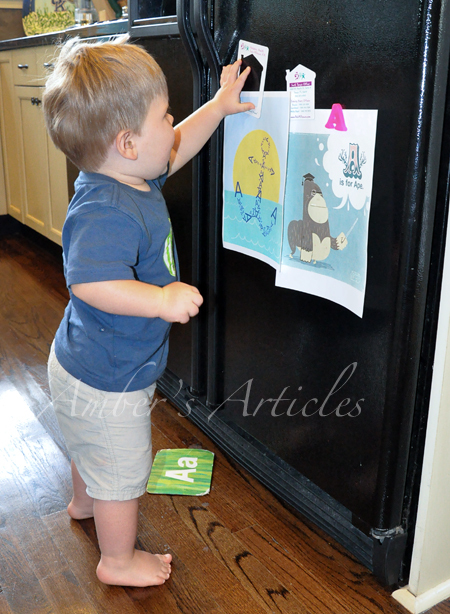 My son really enjoys magnets, so printing a few objects that begin with the letter A was a great way to engage him. I also use 2-4 printed pages when I don't have many objects, that start with the letter I am using, around the house. As you can see, B is dressed in his Apron holding his Apple and Applesauce. You will also notice crayons and a coloring page. 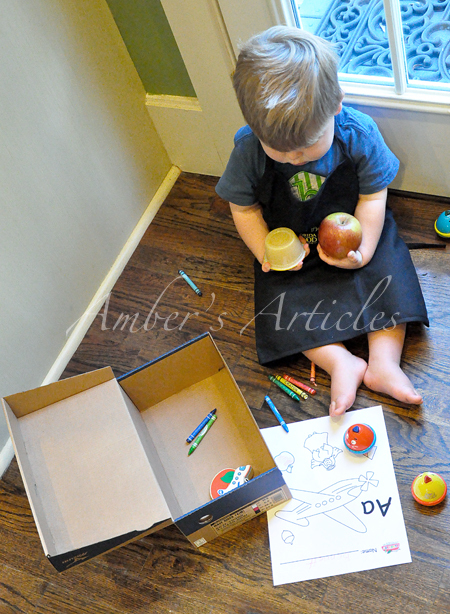 While 12-18 month olds are not technically coloring, one of the developmental milestones is scribbling. Therefore, I give my son any opportunity to use a writing utensil to scribble. The nursery rhyme we listened to was The Ants Go Marching One by One. I really enjoyed the video below, which I originally came across on Mama Lisa's blog. This video includes the hand motions which is typically very engaging for Pre-Toddlers. Don't underestimate your pre-toddlers ability to make the connection between a specific letter and the object beginning with that letter. If nothing else you are encouraging your child to play with objects he/she may be overlooking every day. 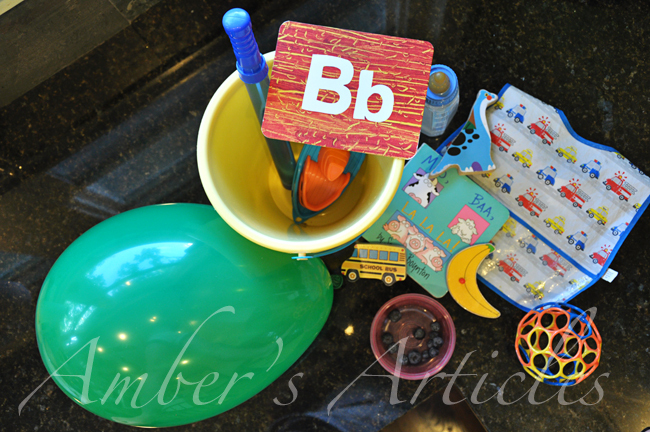 If you begin your own alphabet activities with your Pre-Toddler I would love to hear about it and/or see photos, so be sure to leave me a comment (including your link if you have one). We listened to Baa Baa Black Sheep for the nursery rhyme. We didn't listen to a nursery rhyme, because we were out of town. A lot of good work teaching letters and phonics here! Really like the video - He will never let the righteous fall. Thanks to you and Sam for sharing the article on Family Fountain. It was a huge hit. There weren't a ton of comments, but there has been and continues to be a steady reading of it. I think your blog post received the most visits on its first day of publication. It is hard for me to get an exact count b/c I left town that day for a week and didn't get to monitor it that evening. But, by lunch time (about 2 hours before I left) traffic was already higher than it normally is by the end of the day. So, thanks to you and Sam! And if you ever have a hankering to guest write another article on any subject, the answer is already "yes." I just put a plug in for your blog for another article I published last night. WoW! Love this idea! LOVE IT! I need to get on this for my little one, especially since we're so cooped up in the house, this is PERFECT! I like this idea. I think it'll get me inspired to do some Tot School with B again. I've been thinking about doing a sensory box with him, but worry about small pieces because he still likes to put things in his mouth. This is a wonderful alternative and I think he'll really like it! Amber this is such a cool idea and I love that you are not only taking the time to put this together but, taking the time to invest in quality activities with B. I really need to work on this with Daisy. I feel like I strive more to keep her preoccupied than in educating her in the process...not my strength! I love this idea though and just might work on it! I definitely will be using this with Hunter! Thanks for sharing! As a reading teacher, this post excited me SO much! I LOVE the idea and look forward to forming something similar with Hannah. Thank you thank you! LOVE this idea! I've been doing a letter each week with my 2.5 year old and this will let his little sister (12 mo) join in the fun! Thanks for sharing! Just discovered your blog. 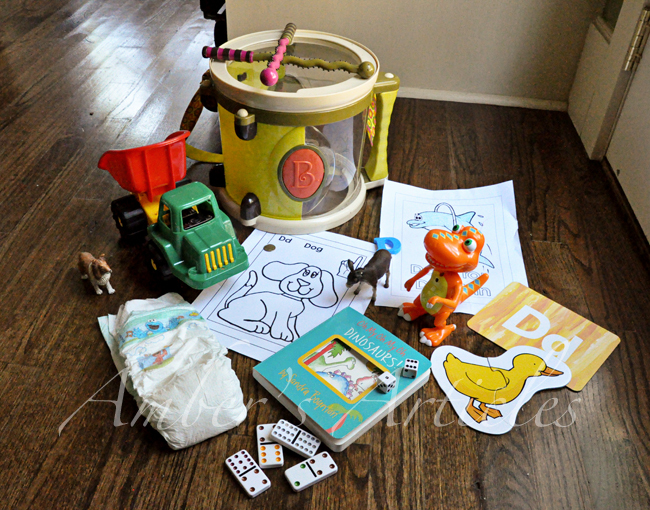 Love all of the ideas for 12-18 mth old activities. I'm seriously going to go start putting alphabet boxes together right now! My little guy will love this. I just found your blog, via Pinterest, and I am sooo excited! I LOVE LOVE LOVE these ideas, all of them! I want to try everything with my little boy who is 13 months! This is great! I have been wanting to start teaching my son his letters and just never knew where to start, until now. He will have so much fun with this. Thanks for sharing! How very Montessori of you! I was planning to do this for my baby (18 months now, but thought she was too younger for it...maybe not) I should start my alphabet collection!